One of the most viewed posts on this blog is the one headlined “One DTV-converterbox for the whole house“. the post is still and steadily growing in attraction since the phrase is a very common search on Google and other search engines. Also, it is a kind of product that many would like to have – lowering the cost and make the transition easier. 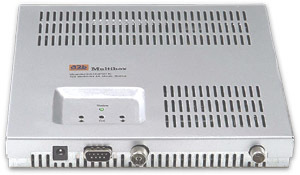 The product the post is telling about is the Multibox – a true “One converter box for the whole house”. Pictured below from the product site at A2B. It doesn’t come in a “applesque” cool design, after all it is supposed to be placed up in the attic.. Many have made comments on this blog and asked about more details for the converter box. One commentator has pinpointed a great thing about having one converterbox for the whole house – it won´t use as much energy as having several boxes within the house. Thinking lean and green is a smart thing. However, I asked Mr. Ari Miettinen at A2B, the company who is producing the so called Multibox, if it is sold on the U.S market yet and what their plans are. Ari told me that the model that they sell in Europe does not work in the U.S due to the different standard for broadcasts in the U.S (ATSC). Mr. Miettinen say that they do understand the great interest in the U.S for a Multibox. And they are developing something for the U.S market. But, they can’t say anything yet about the plans or time until something is ready to be launched. So my advice to you who are interested in a Multibox is to send an e-mail to A2B, expressing your interest for the U.S version of the Multibox. That might speed up the process. And by the way – ask your local DTV retailer if they have anything like it – if not give them a heads up on this one.. This entry was posted on Tuesday, June 24th, 2008 at 1:15 pm and is filed under converterboxes. You can follow any responses to this entry through the RSS 2.0 feed. You can leave a response, or trackback from your own site. I know less about it than before I read it. Waste of time! I would be most interested in a U.S. compatible Multi-box, as would a host of others with whom I’ve discussed this. Please make it available soon.